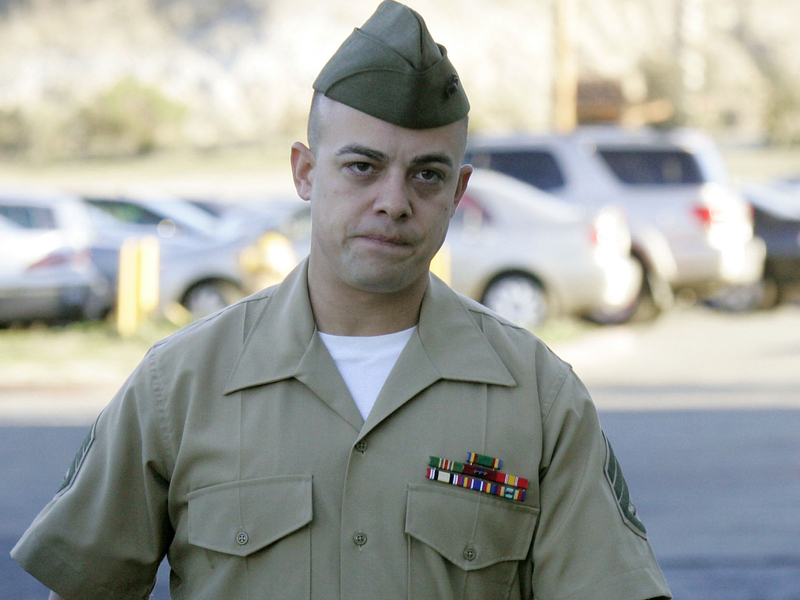 CAMP PENDLETON, Calif. - A military judge has recommended no time in confinement for a Marine sergeant who pleaded guilty to negligent dereliction of duty in assaults by his squad that killed 24 unarmed Iraqis after a roadside bomb killed a Marine in the town of Haditha in 2005. The judge's decision Tuesday at Camp Pendleton, Calif., now goes to the commander of the Marine Corps Forces Central Command for approval. Staff Sgt. Frank Wuterich of Meriden, Conn., entered the plea Monday in a deal that ended a voluntary manslaughter case against him. Wuterich has acknowledged ordering his squad to "shoot first, ask questions later" after a roadside bomb took the life of a fellow Marine, but he said he did not shoot any of the 10 women and children killed in nearby homes that he stormed with his men. "The truth is: I never fired my weapon at any women or children that day," Wuterich told military judge Lt. Col. David Jones, who will recommend a sentence that must then be approved by the commander of Marine Corps Forces Central Command. The contention by Wuterich contradicts prosecutors who implicated him in 19 of the 24 deaths. It also counters testimony from a former squad mate who said he joined Wuterich in firing in a dark back bedroom where a woman and children were killed. During the ongoing sentencing hearing, prosecutors asked Jones to give Wuterich the maximum sentence of three months confinement, a reduction in rank and forfeiture of two-thirds of his pay. They said his knee-jerk reaction of sending the squad to assault nearby homes without positively identifying the threat went against his training and led to the deaths of the 10 women and children. "That is a horrific result from that derelict order of shooting first, ask questions later," Lt. Col. Sean Sullivan told the court. Defense attorney Neal Puckett countered that Wuterich has lived under the cloud of being labeled a killer who carried out a massacre in Iraq. Lawyers also said he has been exonerated of directly causing the deaths of civilians in the two homes and insisted his only intent was to protect his Marines, calling it "honorable and noble." Wuterich, 31, told the court that his guilty plea should not suggest that he believes his men behaved badly or that they acted in any way that was dishonorable to their country. He said he ordered his men to "shoot first, ask questions later" so they would not hesitate in attacking the enemy, but he never intended to harm any civilians. The plea deal that halted Wuterich's manslaughter trial has sparked outrage in Iraq, where many said it proves the United States does not hold its military accountable for its actions. In Iraq, residents of the Euphrates river town of Haditha were angered by the fact that not one of the eight Marines initially charged will be convicted of manslaughter. A survivor of the killings, Awis Fahmi Hussein, showed his scars from being hit by a bullet in the back. "I was expecting that the American judiciary would sentence this person to life in prison and that he would appear and confess in front of the whole world that he committed this crime, so that America could show itself as democratic and fair," he said. In his statement, Wuterich also addressed family members of the Iraqi victims, saying there were no words to ease their pain. "I wish to assure you that on that day, it was never my intention to harm you or your families. I know that you are the real victims of Nov. 19, 2005," he said. A former squad mate testified during the trial that he joined Wuterich in firing in a dark back bedroom of one of the homes where he saw small silhouettes. Later, when former Cpl. Stephen Tatum returned, he said he found woman and children had been killed. Military prosecutors worked for more than six years to bring Wuterich to trial on manslaughter charges that could have sent him away to prison for life. But only weeks after the long-awaited trial started, they offered Wuterich the deal that stopped the proceedings and dropped the nine counts of manslaughter.. It was a stunning outcome for the last defendant in the case once compared with the My Lai massacre in Vietnam. The seven other Marines initially charged were exonerated or had their cases dropped. Legal experts said the case was fraught with errors made by investigators and the prosecution that let it drag on for years. The prosecution was also hampered by squad mates who acknowledged they had lied to investigators initially and later testified in exchange for having their cases dropped, bringing into question their credibility. In addition, Wuterich was seen as taking the fall for senior leaders and more seasoned combat veterans, analysts said. It was his first time in combat. "If it's a gray area, fog-of-war, you can't put yourself in a Marine's situation where he's legitimately trying to do the best he can," said Rooney, who represented Lt. Col. Jeffrey Chessani, the highest-ranking Marine charged in the case. "When you're in a town like Haditha or Fallujah, you've got bad guys trying to kill you and trying to do it in very surreptitious ways." During the trial before a jury of combat Marines who served in Iraq, prosecutors argued he lost control after seeing the body of his friend blown apart by the bomb and led his men on a rampage in which they stormed two nearby homes, blasting their way in with gunfire and grenades. Among the dead was a man in a wheelchair. Wuterich said his orders were based on the guidance of his platoon commander at the time. He has acknowledged the squad did not take any gunfire during the 45-minute raid. Many of his squad mates testified that they do not believe to this day that they did anything wrong because they feared insurgents were inside hiding. Haditha prompted commanders to demand troops be more careful in distinguishing between civilians and combatants.